England’s Trailblazer apprenticeship sector consultation for the Level 7 Historic Environment Advisor (professional) is open until 22 March, and the IHBC Chair James Caird has called on employers – especially IHBC HESPR members that understand the special skills that distinguish conservation practice from generic heritage activities – ‘in particular to respond to the question relating to the preference for a single or core and options standard’. 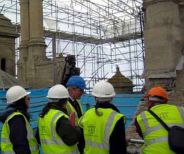 ‘The IHBC has been a member of the ‘Trailblazer’ Apprenticeship Group facilitated by Historic England which has approved this Level 7 Standard for consultation. However, we have expressed our concerns that the Apprenticeship Standard conflates archaeological and conservation duties with the risk that the standard fails to lead towards a professional qualification in either discipline. ‘If, as an employer you are thinking of taking on apprentices, or the organisation for which you work might be considering doing the same, please take some time to respond to the consultation, and in particular address the question relating to the preference for a single or core and options standard’. The Historic Environment Trailblazer is a group of over 50 employers chaired by Historic England. The Government is running a consultation on the suitability of the proposed apprenticeship standards for the sector which is open to all. IHBC’s position set out in IHBC NewsBlog of 1 March does not represent the views of Historic England or the Historic Environment Trailblazer.